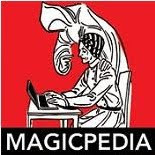 Carnegie: Magic Detective: Houdini's Money Was Always Safe!!!! Houdini's Money Was Always Safe!!!! 100 pounds Will Be Paid To Anyone Finding Traps, Panels, Or False Doors In the Cell. And I'm sure there were none, otherwise he would not have risked a financial loss. The flyer to the left is interesting. It actually contains two monetary challenges. But it's also different from most of Houdini's offers of this kind. In this poster, his first offer is $100 to anyone who can release themselves from all the cuffs that he carries, and from which he releases himself. This is pretty bold and like many of his challenges covers himself fairly well. He points out that he allows the key holes to be stamped and sealed and will bring out all the cuffs interlocked, proving he does not slip the cuffs of his wrists without unlocking them. 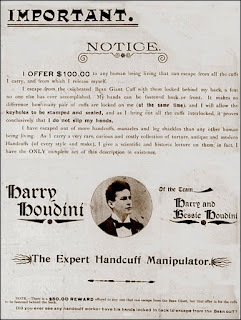 He further ads, he carries a very rare curious and costly collection of torture, antique and modern handcuffs. This line is likely to deter any would be takers. 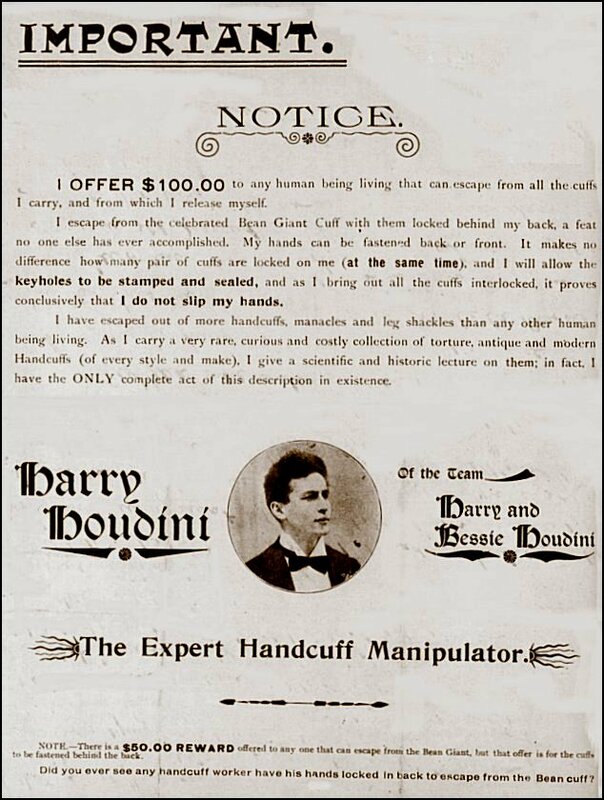 Finally, at the end Houdini offers a second challenge of $50 to anyone who can escape from the Bean Giant cuff with those cuffs strapped behind the person's back. This challenge is not quite as safe as the previous, so the reward is less. One of his most unique money offers was with the Water Torture Cell. The exact wording on the poster, "...Reward To Anyone Proving That It Is Possible To Obtain Air In The UP-SIDE-DOWN Position In Which Houdini Releases Himself From This Water-Filled Torture Cell"
In England the reward was 200 pounds. In Germany, the reward was 5000 marks, In the United States it was $1000. And the truth was, he could have offered any amount of money as the money was never in any danger of being lost. The reward doesn't say to prove it's possible to obtain air while inside the cell, it says prove its possible to obtain air IN THE UPSIDE DOWN Position. That's the key phrase and it's the one that keeps his money safe! The allure of winning money is a very power motivator for people. Look at all the people who buy lottery tickets. Well, Houdini wasn't gambling with his money. He clearly worded things very carefully to keep his money safe. 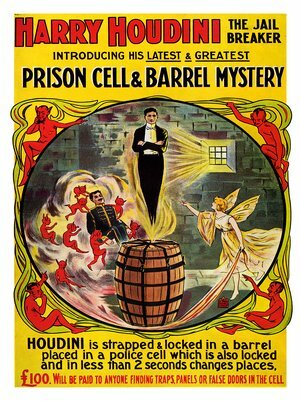 Houdini didn't restrict his Money Challenges to his act. Below is an ad for his movie, The Grim Game where he offers yet another reward. 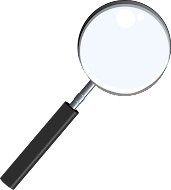 This time, it's a $1000 reward to anyone who can prove that the airplane accident in the movie didn't take place. Later in life, he did step it up a bit. When he launched his campaign to fight fraudulent spirit mediums the offer became $10,000 to any Medium who could produce any Physical Phenomena that he cannot reproduce or explain by Natural means. Houdini's wife Bess kept this $10,000 challenge going after Houdini's death. According to Joseph Rinn, friend of Houdini's and fellow paranormal skeptic, Bess Houdini offered the reward to any medium able to prove, to her satisfaction, the survival of her husband in the spirit world. It looked like in 1928 Arthur Ford might have won the reward after revealing the Houdini code. Even Bess came out and said it was genuine. But days later, after the media fire storm, they began to debunk it, along with Dunninger and others, Bess finally recanted saying there were ways Ford could have discovered the code. She continued doing her Seances to reach Houdini until the Final Houdini Seance in 1936. After that, fans and friends of Houdini have picked up the ball, and though no reward is offered, Houdini has yet to show up. The monetary challenge was a gimmick Harry used pretty much all his adult life. It meant that he meant business!